Approximately 4.2 million tons (2 million tons based on B2O3) of boron were produced in 2016 in the world. 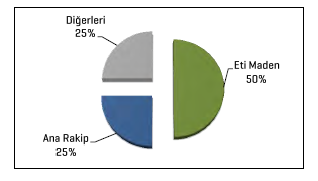 In world B2O3 based boron production, Eti Maden (Turkey) ranks first with a 50% share, USA with 25% and other countries with 25% percent are trailing Turkey. World boron products consumption was 3,1 million tons in 2000, increased to 4,3 million tons in 2014, 3,8 million tons in 2015 and 3,77 million tons in 2016. Consumption of boron products on industrial basis in the world: 48% glass sector, 15% agriculture, 15% ceramic industry, 2% cleaning and detergent sectors and 20% other sectors.